The Cadet World Championships 2017 continued on Thursday as 127 of the world’s top young judoka staked their claim to win the most coveted title in judo at this level. 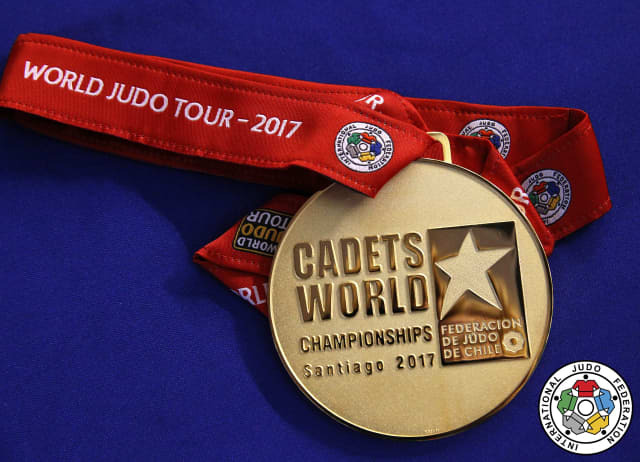 On day two at the Santiago National Stadium, Cadet World Champions were crowned in four more categories and four different countries won gold in a repeat of the opening day. The girls’ -48kg and -52kg categories along with the boys’ -60kg and -66kg categories were settled as Japan pushed in front at the halfway point of the individual competition before Sunday’s mixed team event. 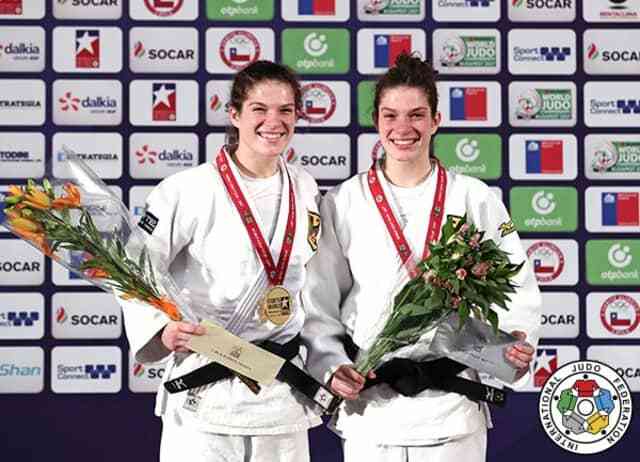 German twin sisters experienced mixed emotions as Mascha BALLHAUS (below - right) took -48kg silver while -52kg judoka Seija BALLHAUS (below - left) went all the way to win their country’s first gold medal in Chile. After day two, Japan are up to two gold medals and only Russia have matched that, while Germany are third having registered once in each medal column. On Friday, the attention switches the middleweights with the girls’ -57kg and -63kg categories being contested in addition to the boys’ -73kg and -81kg categories. Hungary are at the epicentre of the judo world in August and their stock is on the rise at all levels. 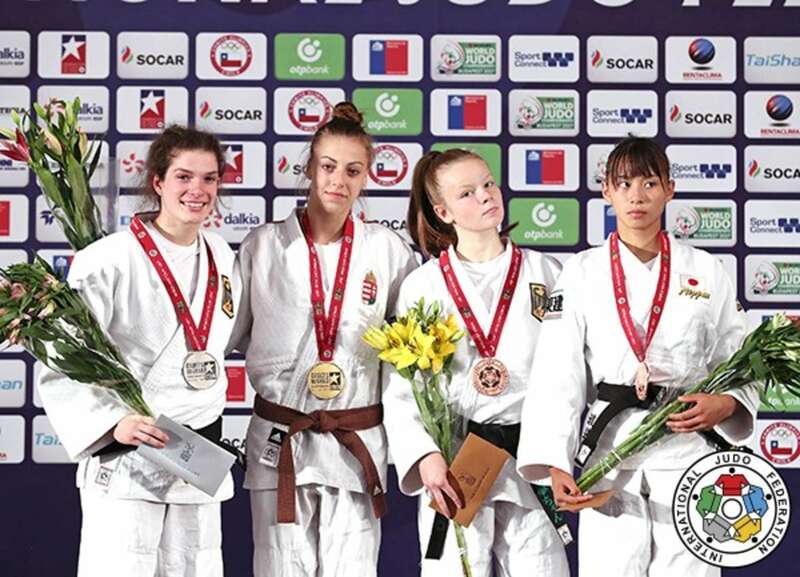 Three weeks before the Hungarian Judo Association stages the seven-day senior World Championships in Budapest, their young charges have set about making their own headlines in Chile. EYOF bronze medallist Brigitta VARGA (HUN) is one such judoka and the 15-year-old proved too much for Cadet European Individual and Team Championships gold medallist Mascha BALLHAUS (GER) in the -48kg final. VARGA countered her German opponent in golden score after 49 seconds and that waza-ari determined the destination of the first gold medal contest on day two. In the first semi-final EYOF winner Andrea STOJADINOV (SRB) lost out to VARGA who threw beautifully with a uchi-mata for ippon. In the second semi-final BALLHAUS defeated 15-year-old Cadet Asian Championships winner Sita KADAMBOEVA (UZB) by a waza-ari after 14 seconds of golden score. 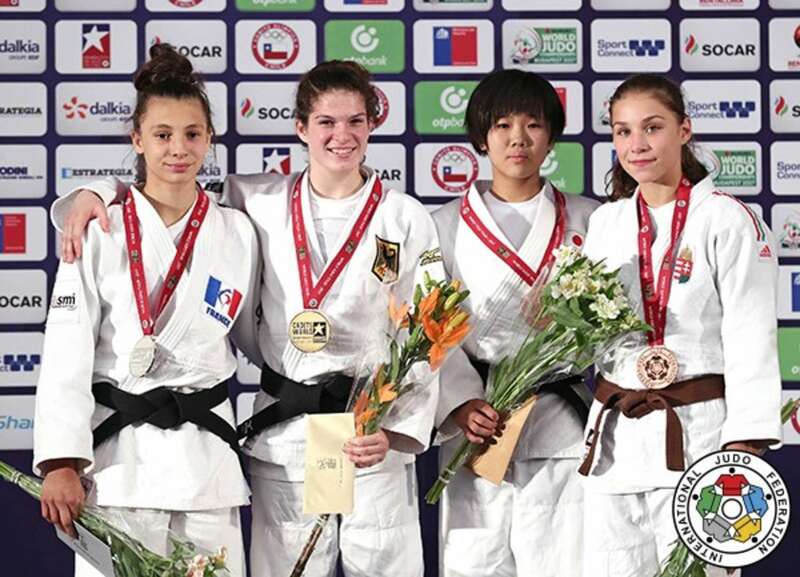 The first bronze medal was won by Cadet European Championships bronze medallist Jana GUSSENBERG (GER) who produced the only score of the contest against KADAMBOEVA. A driving ouchi-gari sent the Uzbek over for a waza-ari score which was enough for bronze for Germany. The second bronze medal was claimed by Bielsko Cadet European Cup winner WATANABE Aiko (JPN) who was relentless in her pursuit of a place on the podium. The Japanese judoka scored a waza-ari from a neat ashi-waza movement and STOJADINOV went further behind to a second waza-ari from a ko-uchi-gake. WATANABE sealed bronze with osaekomi as her Serbian rival could not escape the powerful clutches of the former. Cadet European Championships bronze medallist Seija BALLHAUS (GER) won a second medal on day two for Germany and the BALLHAUS family as she was able to go one better than her twin sister by besting Cadet European Team Championships bronze medallist Faiza MOKDAR (FRA) in the -52kg final. While -48kg silver medallist Mascha BALLHAUS wiped away the tears, as she waited for her medal ceremony, Seija surged past her French foe in just 45 seconds. The German fighter tapped out MOKDAR on the ground with a koshi-jime strangle to secure the most prestigious title of her rising career. In the first semi-final contest 15-year-old Cadet European Championships winner OZBAS Szofi (HUN) was beaten by MOKDAR in golden score. 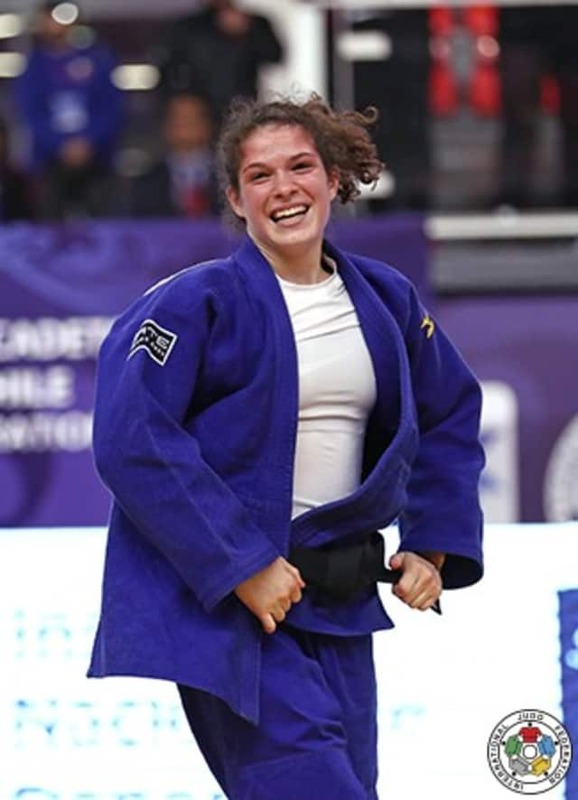 The Hungarian EYOF bronze medallist was penalised for passivity and it was her third shido which resulted in disqualification and progression for her French opponent. In the second semi-final 16-year-old Cadet Asian Championships bronze medallist Nilufar ERMAGANBETOVA (UZB) was defeated by BALLHAUS when the Uzbek picked up her third shido for passivity. The first bronze medal was claimed by KOBAYASHI Mina (JPN) in golden score with a medal-winning waza-ari score after 11 seconds of additional time. The second bronze medal contest was won by OZBAS who returned to winning ways by holding down MUN Song Hui (PRK) in a kesa-gatame for 20 seconds as Hungary featured heavily on day two. Cadet European Championships winner Kazbek NAGUCHEV (RUS) defeated one-time Cadet European Cup winner Nurzat SALIMBAYEV (KAZ) to win the Cadet World Championships. 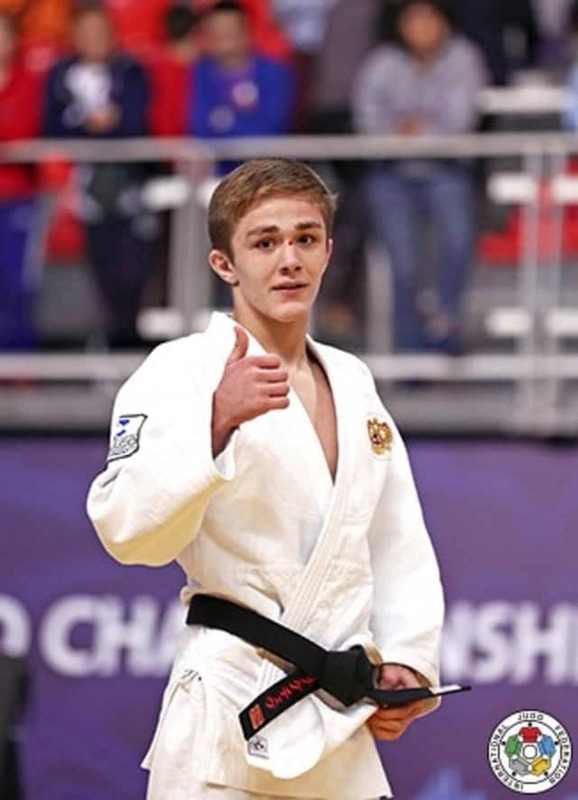 The Russian’s brother Abrek NAGUCHEV (RUS) took -55kg bronze on day one and was leading the vocal support for his sibling who seized the occasion. Kazbek NAGUCHEV won all his five fights by ippon including the final where he utilised osaekomi-waza. In the first semi-final NAGUCHEV held down national cadet champion KONDO Hayato (JPN) for 20 seconds to advance to the gold medal contest. In the second semi-final SALIMBAYEV defeated Cadet Asian Championships winner BAYANMUNKH Narmandakh (MGL) by ippon having initially been in front by a waza-ari score. The first bronze medal was won by BAYANMUNKH who thwarted 17-year-old Cadet European Championships bronze medallist Vadym CHERNOV (UKR) by a waza-ari score to clinch his country’s first medal in Chile. The second bronze medal was won by KONDO who catapulted Luigi CENTRACCHIO through the air with a seoi-nage for ippon. The Italian, who had his older sister and national team member Maria CENTRACCHIO and his father in the crowd, was undone by the explosive Japanese judoka who persevered after a blip earlier in the day to find a route onto the medal podium. 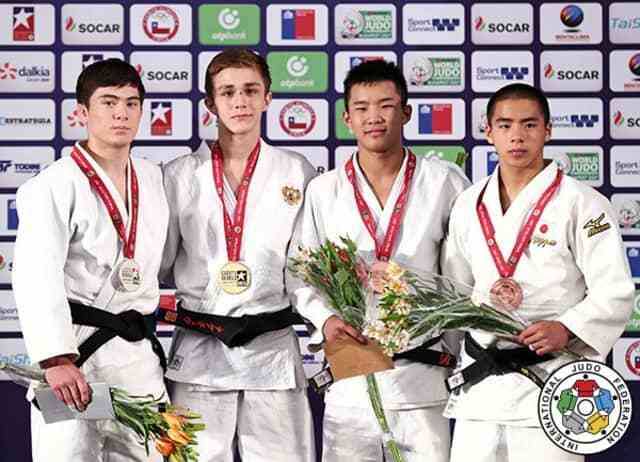 Bielsko Cadet European Cup silver medallist KATSURA Ranto (JPN) was the outstanding judoka in the -66kg category as he dominated 17-year-old national junior champion Mark HRISTOV (BUL) in the -66kg final. The 16-year-old Japanese judoka was wondering what all the fuss was about as the photographers and audience were left in awe of his array of scoring techniques while he remained cool and collected. Two waza-ari scores, including an eye-catching uchi-mata, gave him control but HRISTOV, 16, never gave up and pulled a waza-ari back before the time ran out on his world title bid. In the first semi-final HRISTOV won an epic against Cadet European Championships bronze medallist Dmitrii PRIDIRA (RUS). Five minutes of additional time was required to separate the two judoka as they left it all on the tatami. The Bulgarian pulled through as he pinned down his Russian rival for 20 seconds and ippon. In the second semi-final KATSURA threw Cadet Balkan Championships silver medallist Bayram KANDEMIR (TUR) with a picturesque harai-goshi for a waza-ari score as the Japanese made a bullish start. KANDEMIR struggled to contain the Japanese livewire and was disqualified after receiving his third shido. 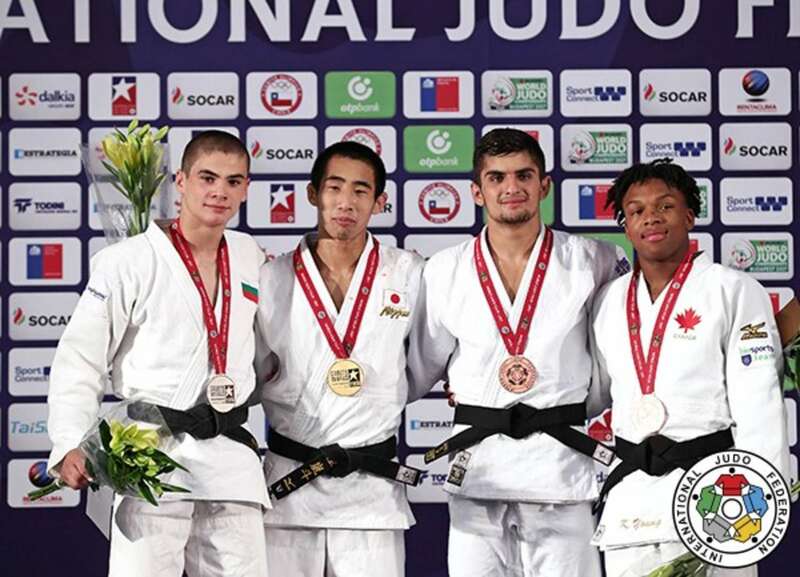 The first bronze medal was claimed by 17-year-old Cadet Asian cup winner Dhzamoliddin ABDULLOEV (TJK) who made KANDEMIR submit to shime-waza for ippon. The second bronze medal was captured by the impressive Cadet Pan American Championships bronze medallist Keagan YOUNG (CAN) who saw off PRIDIRA by two waza-ari scores. The Canadian, who was coached on the IJF stage for the first time by Scotland’s James MILLAR, was good value for his medal return after scoring two ippons and six waza-ari in his five contests to open Canada’s medal account in Santiago.